On your drive into work, have you ever noticed a cyclist commuting to work and admired that person? Maybe, you think, it would be cool to ride a bike to the office? 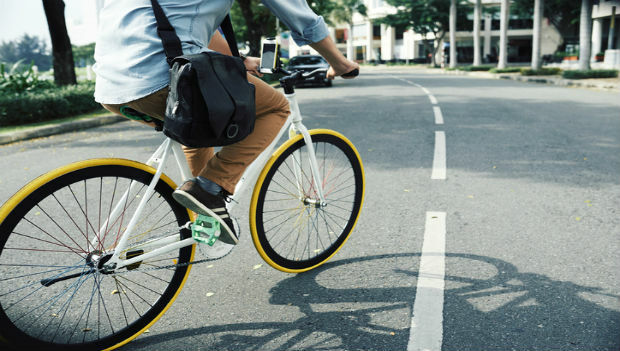 Perhaps it's crossed your mind that bike commuting not only helps the environment and saves gas money, but it can also help you stay fit, healthy and burn a few extra calories. Despite the obvious reasons to ride your bike to work, there never seems to be a good time to start. So why not start now? Even if you commute only a handful of times, it's better than none at all. To help you get rolling, here are 13 tips to get started. If you live only a few miles from work, it is conceivable that you can commute both ways on the first day. If you live several miles away and the commute will take you 45 to 60 minutes or more, consider hitching a ride with a co-worker to get to the office, then ride home. Make the distance doable for you; don't worry about what other people might be doing. Sure, it sounds good that you're turning over a new leaf, and you have grand plans to commute to and from work every day. But is that goal achievable immediately? Begin by setting a goal to commute one to three times per week. After you can consistently achieve success, add more commuting segments or days. In the unlikely case of an accident, you want to protect your head and all those great ideas. If you're worried about how your locks might look after a ride to the office, bring a brush or comb to address the situation once you arrive. If you are commuting in the early morning or late evening hours, wear reflective gear and put a flashing tail light on your bike. For daylight commuting, wear bright colors that can easily be seen by motorists. Depending on the distance of your commute, you might be able to commute in your work clothes. Some commutes feel more like workouts while others are more casual in nature. When I was in the Italian city of Ferrara, I saw women riding bikes to work in business suits with a brief case strapped to the luggage rack. They were wearing low pumps and using platform pedals. Bike commuting appeared to be commonplace. If your commute is longer than 20 or 30 minutes, you will probably be more comfortable in cycling shorts. Cycling shorts eliminate that intersection of seams that meet right where you are positioned on the bike seat. Pressure and friction can make this area really uncomfortable when cycling longer distances. Cycling shorts (worn without underwear) can significantly improve your comfort. If you're nervous about how much time it will take you to get to work, do a dry run on the weekend. Ride at an easy pace, knowing that if you were in a bind for time, you could pick up the pace. It may lengthen your commute some, but finding roads that aren't as busy might be worth your time. Check out any bike paths in the area to see if they would be a good choice. If you don't already know how to do it, learn how to change a flat tire. If you have time to change a flat tire or deal with other mechanical issues on the way into work, fine. If you're pinched for time, call someone to give you a lift. There's a good chance you're on the road well before anyone else, so it's likely a co-worker will come your way. If you plan to change from cycling clothes to work clothes when you commute, bring your clothes to work the day before your ride. Some commuters will want a full shower before sitting next to coworkers. Or maybe it's the coworkers that want the commuter to have a shower? Either way, lucky commuters can shower at the office. If that's the case, use a chamois towel (popular among swimmers) to dry off rather than having to lug around a full-sized bath towel. If you don't have a shower, you can use a wash cloth and soap in the restroom to give yourself a "spit bath." Some commuters will shower the night before the ride into work, then they will at least clean off their body with a moist towelette without having to take a full shower. Be alert for cars parked on the side of the road. Take note if there are people in the car that might be getting ready to swing open the car door. They might not be looking for you coming from behind on a bike. After you scheme up strategies to be successful on that first commute, you might find yourself wanting more. Even hard-core commuters started somewhere. The commuters I know that bike to work regularly do it because the personal rewards are so great.